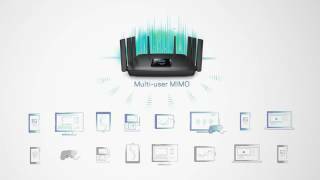 Linksys EA9500 Max-Stream™ AC5400 MU-MIMO Gigabit WiFi Router is rated 4.2 out of 5 by 390. Three bands that deliver the fastest combined WiFi speeds to more devices. Experience powerful WiFi coverage throughout a large house. Monitor and control your home network from anywhere through the Linksys Smart WiFi website or mobile app. Designed as a dual-purpose home office and entertainment WiFi router, the MAX-STREAM AC5400 MU-MIMO Gigabit WiFi Router (EA9500) delivers WiFi to multiple users on multiple devices at the same time and same speed. The MAX-STREAM AC5400 MU-MIMO Gigabit WiFi Router (EA9500) offers Seamless Roaming as you move around your home when linked with a MAX-STREAM Range Extender. With Seamless Roaming, your enabled wireless devices will automatically switch to the strongest WiFi signal, so you won't have to manually connect to the router or range extender when you move from one room to another--or even to your garden. ** This means that you can move freely throughout your home while video chatting or streaming videos without experiencing dropped calls or buffering. Pair a MAX-STREAM range extender such as the RE7000 with the AC5400 for more efficient home WiFi that delivers stronger, more powerful WiFi signal to all your devices. If you're working in your home office, you can quickly download large files thanks to the MAX-STREAM's 1.4 GHz dual-core processor, which delivers the performance necessary for seamless videoconferencing and fast file transfer. The AC5400 is capable of handling multiple high-speed data streams at once--delivering faster WiFi speeds to more devices. With the MAX-STREAM AC5400 MU-MIMO Gigabit WiFi Router (EA9500), your work files, data, and home network information are safely connected with WPA/WPA2 encryption and an SPI firewall. 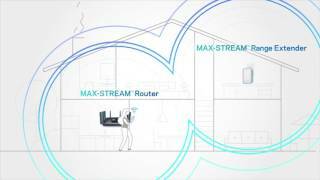 The MAX-STREAM AC5400 offers three independent WiFi bands that deliver extremely fast combined speeds of up to 5.3 Gbps. * Tri-Band technology delivers up to double the Wireless-AC performance of a dual-band router. High-bandwidth applications like videoconferencing and movie streaming are ideal for the two high-speed 5 GHz bands, while lower-bandwidth devices like older wireless-N and -G computers can utilize the 2.4 GHz band. The router features eight adjustable external antennas, which can be positioned for optimal performance. They provide powerful streams of data to your devices, ensuring complete WiFi coverage throughout your home. Unlike the two or three data streams found on other routers, the AC5400 delivers four simultaneous streams per band for stronger, faster performance. Play video games, listen to music, check email, shop, stream movies, and more--without having to worry about signal drop-off. Beamforming technology directs WiFi signals to each of your mobile devices. This focused direction provides increased signal strength and coverage. "Designed for the impending deluge of bandwidth from 4K video, online gaming, and the rise of streaming content"
Rated 1 out of 5 by smjohnson85 from Not at all satisfied I bought this unit a year ago at Best Buy. After 30 days the first unit suddenly stopped sending a wifi signal. Took it back to Best Buy and they gladly replaced it with the same model. Now after about 8 months this unit sporadically send out a wifi signal. Working with their tech support we were unable to reboot or connect to the wifi network. It should show two networks, a 2.4ghz and a 5.0 ghz. It only shows the 5.0 anduanable to join network even with the default password and a hard reboot. I have had nothing but problems with this unit. Very disappointing for a $300+ router. Either I get an upgraded model or I will go to another brand. Rated 2 out of 5 by the_chux from Still can't handle network customization Linksys has always loved the 192.168.1.0 class C private network. Attempt to break that mold and use 172.16.0.0 or 10.0.0.0, and you'll run into issue after issue. I can't pick my own internal network, register DHCP leases, and am barely able to manage my router properly (with latest firmware). Way to swing for the fences Linksys... A big selling point for this is that the app is supposed to make it very easy to manage. ... With the issues of creating your own network, the app only works half of the time (but that's for an app review). With the price tag that comes with this, I expected more, but have been let down by Linksys once again. Rated 1 out of 5 by Rick from Linksys EA9500 High end router is Garbage!!!! I really tried to give this router a chance but after two months of intermittent routing issues between between wireless channels I decided to return it. For a high end router at this price point, it has no real capabilities beyond providing wireless coverage and of course 8 LAN ports. No openvpn support, no jumbo frame support (which killed my NAS backups), no way to configure netbios name, etc. there was just nothing special about it. I will admit that the wireless coverage it provided was outstanding but that's about the only good thing I can say about it. Rated 2 out of 5 by Simple from Unable to Keep Wireless Connection I've been a fan of Linksys products for many year. I purchased this router a little over a week past and I've been nothing but frustrated with the connection. As quickly as I connect via wireless, I also lose connection. The router did an update of the firmware when I did the setup so unsure if it is tied to that. I'm seriously considering returning to the place or purchase. I put my WRT1900 back to work and it's working just fine. I was hoping for better coverage with the new router as I have a dead spot in my home. I would still recommend Linksys products to those who ask, just not this product. Rated 5 out of 5 by Tracy from Best router on the market This is the best router I have used thus far in my life. Linksys goes above and beyond and sent me a NEX GEN AC usb wifi adapter after I received my router. This is amazing customer service. Now the router... My speeds are through the roof. I expected that. The range, however, is ridiculous... RIDICULOUSLY FAR!!! (It's a good thing.) I have a two-story 4000 sq ft home. It covers that without any problems. But there's more, I can get a strong signal on 80% of my half acre backyard. I walked all the way out to the slopes of the hill and still had 2-3 bars of wifi signal. THIS IS ALL WITHOUT A RANGE EXTENDER. Amazing product. Highly recommend. Rated 5 out of 5 by PedroRodriguez55 from Best Router For My Need. I struggled trying to find the right Router strong enough to fulfill my need and demand, but not anymore. The AC5400 is strong enough for my Netflix 4K account to be running in the background while my all old PC is downloading movies and I'm doing school work in my Mac computer all of this without slowing the games I'm playing at the same time in my 2 iPhones. It's also strong enough to reach every corner of my 3 bedroom apartment without the need for me to set it up on the middle of the apartments. I still do recommend to set up your router in the middle of your home but if that not possible for you, just know that this router is strong enough to handle huge places. Rated 4 out of 5 by TSchmitz from Eight Gigabit Ethernet ports! I got this router last Tuesday. Immediately upon opening the shipping box, a label on the front of the router box caught my eye. It read, " 3-Year Warranty + 3-Year Tech Support $200 Value." Wow! I never heard of that before. Immediately upon examining the router, I noticed the eight Gigabit Ethernet ports on the back, Finally! I quickly tried to evaluate my need to determine which of my lucky devices would populate those port. Ultimately they were, one HP Stream running my Plex server, two Linksys media hubs, one Philips Blu-ray disc player, one LiftMaster my Q, one Tablo one Wii U U, and one for use in setting up PCs in my small office/home office business. I also populated both of the USB port with identical Iomega hard drives also used with my Plex server. For whatever reason, one port is USB 3.0 while the other remains USB 2.0. The only hiccup that I experienced was connecting to a Linksys Wireless‑AC USB Adapter, but once I upgraded the drivers to current, it connected worked fine. Notes: Tri-band devices provide a single 2.4GHz radio and two 5GHz radios. All testing used 5GHz band. Average of three runs.